Attorney General Tarek William Saab makes request to the government-stacked Supreme Court, and also asks for Guaidó's financial accounts to be blocked. Venezuela's chief prosecutor on Tuesday asked the country's top court to ban opposition leader Juan Guaidó from leaving the country, launching a criminal probe into his anti-government activities while international pressure builds against President Nicolás Maduro. Attorney General Tarek William Saab made his request to the government-stacked Supreme Court, and also asked it to block Guaidó's financial accounts. 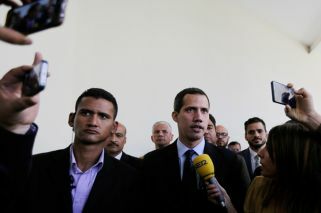 Saab didn't specify what crimes Guaidó is being investigated for, but said the probe is tied to unrest sparked by his decision to declare himself interim president last week in a direct challenge to Maduro's authority. Guaidó said outside the National Assembly building that he's aware of personal risks, but added, "Venezuela is set on change, and the world is clearly conscious of what's happening." "I don't underestimate the threat of persecution at the moment," he added, "but here we are." While rights monitors say hundreds of demonstrators have been arrested in recent days, Guaidó has so far avoided arrest while making regular public appearances in recent days. US National Security Adviser John Bolton reiterated Tuesday that there will be "serious consequences" for anyone who attempts to harm Guaidó, though he didn't specify what that response might be. Opening a case against Guaidó comes as international pressure mounts against Maduro's government from the United States, which earlier in the day handed control over Venezuela's US bank accounts to Guaidó. Russia announced it expects Venezuela to have problems paying its debts. US Secretary of State Mike Pompeo certified that Guaidó, the congressional leader who has declared himself interim president, has authority to take control of bank accounts that Venezuela's government has in the Federal Reserve Bank of New York or any other US-insured banks. Guaido has been recognised as the nation's rightful leader by two dozen nations, including Argentina, that contend the re-election of socialist President Nicolás Maduro was a sham, in part because his strongest opponents were barred from running. He moved forward with building a transition government on Tuesday, naming nearly a dozen new diplomats to nations that have recognised him as interim president. Street demonstrations erupted last week when Guaidó during a massive opposition rally in Caracas declared that he had assumed presidential powers and planned to hold fresh elections, ending Maduro's "dictatorship." The United States, Brazil, Canada, Colombia, Argentina, Peru, Ecuador and Paraguay have officially acknowledged Guaidó as the legitimate interim head of Venezuela, while countries including Russia and China back Maduro. Inside Venezuela, Maduro holds the reins of power with the Armed Forces still loyal despite an opposition push to lure their support by proposing amnesty for anybody who supports Guaidó's transitional government. On Tuesday, Maduro announced that he would beef up the nation's defence by expanding Venezuela's civilian armed militia to two million members amid escalating tensions with the US. The reserve force was created by the late Hugo Chávez to train civilians to assist the armed forces and defend the socialist revolution from attacks. Maduro made the announcement dressed in an olive cap and shirt before rows of troops before overseeing a military training exercise. The embattled leader is accusing the United States of leading an open coup to oust him and exploit Venezuela's oil reserves, the largest in the world. On Monday, the US hit Venezuela's state-owned oil company with sanctions aimed at increasing pressure on Maduro to leave office. "Once more we'll come out victorious," Maduro pledged. "We are on the right side of history." Storchak said Venezuela owes Russia US$3 billion, with repayments twice a year of around US$100 million, with the next due in March. Russia also has extensive commercial interests in Venezuela, including state oil company Rosneft's partnership with Petroleos de Venezuela SA, which was placed under US sanctions Monday. The US State Department, meanwhile, said that US citizens shouldn't travel to Venezuela, warning of unrest, the threat of being arbitrarily arrested and of mass demonstrations occurring with little notice.